. Some wonderful designs include Mr and Mrs Pickles, the pair of hedgehogs that so startled Yorkie! One of these owls hooted! Perhaps he also saw the turtles! She described her Midnight Garden series (BTW there is a bead giveaway on her blog too) as a personal challenge project using a deliberately limited color palette. She wanted to create a fairy tale-like themed body of work. She said, "I have a mental image of a secret walled garden bathed in the light of the full moon at midnight, all overgrown with twisting vines and leaves, full of night blooming flowers and mystical creatures, where magical things happen if you are fortunate enough to witness them." One of my favorites is her Gateway to the Garden pendant necklace. 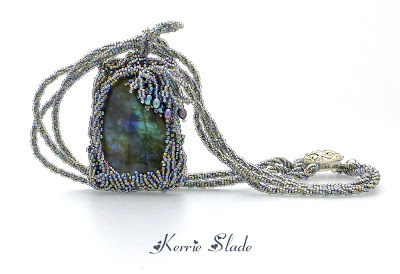 Her imaginative use of just the right labradorite gemstone makes it really look like you are peeking into the garden and perhaps catch a glimpse of "fairies dancing in the moonlight." Now that is magical! Dear Pearl ... you have made Yorkie's day! And you have put a pretty big smile on my face too - thank you! I love that! So creative and magical - and those hedgehogs are adorable!